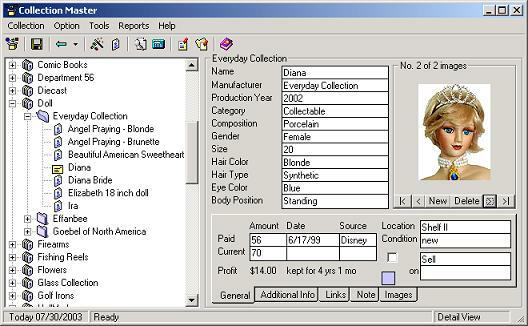 Collection Master allows you to manage all your collections in one single program. It provides maximum flexibility: 10 fully customizable fields, plus an unlimited number of additional fields. It helps you keep track of purchasing information, such as how much you paid, where and when. It automatically computes the profit. Report on each of your collectibles. Report on an entire collection. Report on financial information. And the powerful customizable reports. Ever wonder where to find your collection item? Collection Master searches every field of each item and finds them for you. Collection Master makes images your friends. Each of the collection items can have an unlimited number of images. Adding an image is just a matter of drag and drop. Ever want to display your collections on the Internet? Collection Master provides a Web Wizard to generates Internet-ready HTML pages. Each collection item may have an unlimited number of links: links to Word document, music, images, and your favorite websites. The unique task list shows you all your tasks: Buy, sell, ordering, maintenance, update insurance files. Don't know exactly how to manage your collectibles? Collection Master is shipped with over 60 pre-loaded templates. From Barbie to firearms. And if your collectibles don't fall into any of these templates, Collection Wizard will help you create your own. Or, just come back and visit the Templates page. We may have new template updates. Have secret collection? Don't worry, Collection Master protects your collection from 'unauthorized break-ins'. Bought a new computer? Your collection data don't just stick with your old hard drives. With Backup and Restore functions, your collections stick with YOU. You can view your collections in different views. Detailed view shows every field of an item. Summary view browses through all items in a collection. The collections list is just lovely. Shows you all the collections and all items in one screen. Nobody can do everything right the first time. Collection Master allows you to move around and re-organize your collections. Tired of re-typing the same thing again and again? With Collection Master, you can clone an item. It's the best way to enter a series of similar items. Collection Master is loaded with good stuff. It may take you three month to find out all the secret features. We will continue our efforts to support Collection Master. We frequently send out questionnaires to our customers to gather their opinions. What's good and what's bad, we know it all. We will keep adding new features and new functionality. And we will make this product better and better. If you have any suggestions, just let us know. We will listen to you.